For the past couple months, I’ve been working on one of my sister’s baby showers (yes another one) all the while trying to focus more on blogging and my etsy shop. Etsy has been slow this month for me, so it’s given me a little breathing room to get stuff done in preparation for the baby shower. 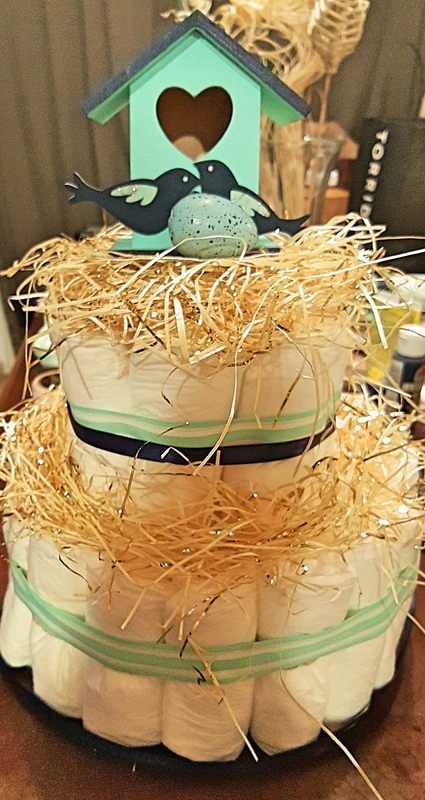 Since my sister is obsessed with birds, I of course decided to do a bird themed baby shower since this will be her last child. I bought most of my supplies from Joanns since I can use multiple coupons, which in turn saves me more money. Premade bird houses at Joanns are inexpensive. All you need is a little paint and some paint brushes. The colors she wanted were mint and navy blue. I had a hard time finding mint colored items, so I made due with other color variations. For baby showers, I try to create stuff that won’t get thrown away. That way, my time, money and energy isn’t wasted. I then created a bird themed name banner out of card stock paper and ribbon. I always do a name instead of “baby shower” or “welcome baby” because they’re more likely be tossed in the trash. 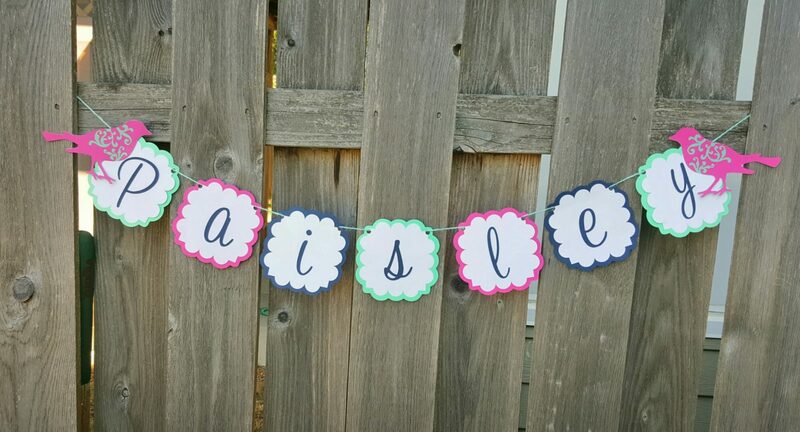 Name banners can be hung in the nursery by a crib or bed. 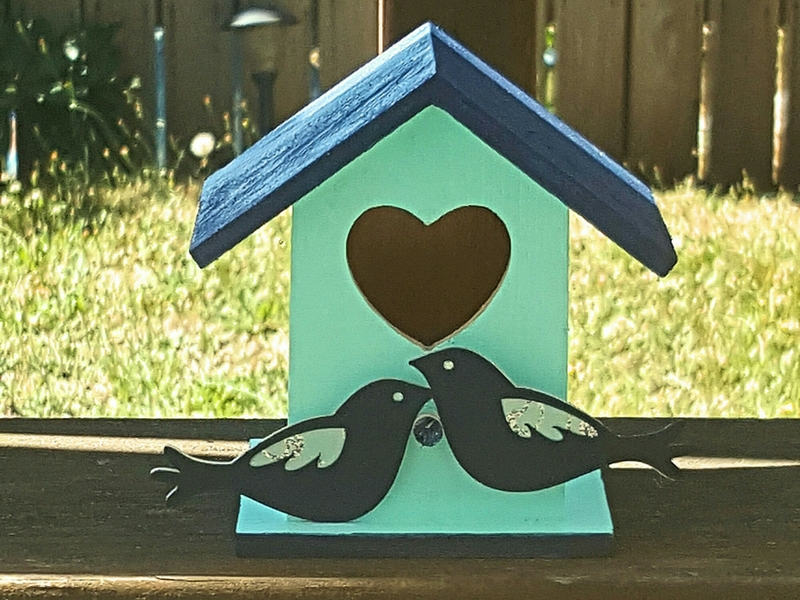 I found this pink chalkboard sign at Michaels on clearance for a couple dollars, but I didn’t have mint colored vinyl so I decided to paint it the same color as the bird house and applied navy blue vinyl. The vinyl wasn’t wanting to stick to the paint, so I had to put a mod podge gloss coat over it to get it to stay. It worked and gave it a glossy effect instead of matte and flat! I found the premade bird nest at a vintage shop for a few bucks, so I grabbed it and applied it with some mod podge as well. For the item below, I had a little something different in mind. I didn’t find the right type of twig branch I wanted to use, so I made the thick branch work instead. 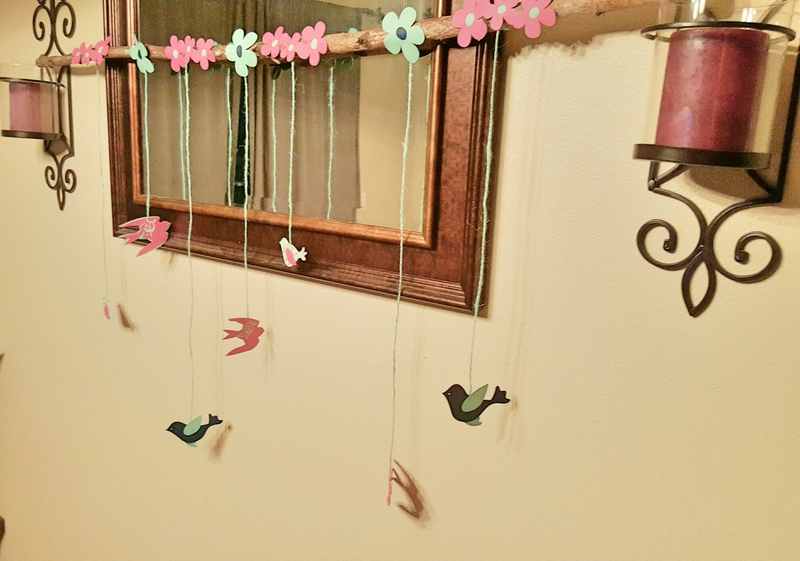 I cut out double sided birds in coordinating colors to the theme (I decided to add in pink since navy blue and mint didn’t scream WELCOME BABY GIRL Lol) and dangled them from twine. Then I added flowers onto the branch with some mod podge. Makes a great backdrop and nursery decor for a little ones bird themed room. Again, not the best photo, but I had no other place to hang it with natural light near. I also made some bird shaped bird feeders out of bird seed, gelatin, honey and water. My friend picked up the bird seed and it wasn’t the right type. It didn’t want to dry very well inside the cookie cutters and kept breaking in spots. These 6 were the only ones to survive and then I left them at home. Go figure. They were supposed to be a favor gift for those who didn’t win any of the games or diaper raffle. And unfortunately, the baby shower day we selected called for rain. There was no real protection from getting wet since we were outside at a park, so we packed stuff up and moved it to my sisters small apartment since half the people didn’t come anyways. I hate that! But at least she enjoyed it and I guess that’s all that matters. 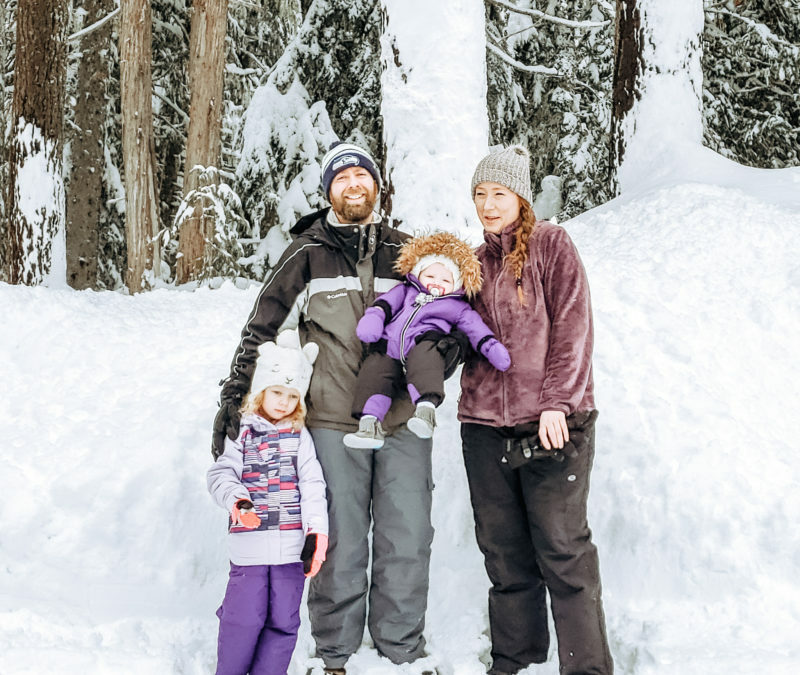 But, that’s PNW weather for ya! Felt like the first official day of Fall and looked like it too. When I set stuff up at the baby shower, I didnt get any pics and neither did anyone else besides that one. There really wasn’t a place to put everything to make it cute, but I made due with the space we had. 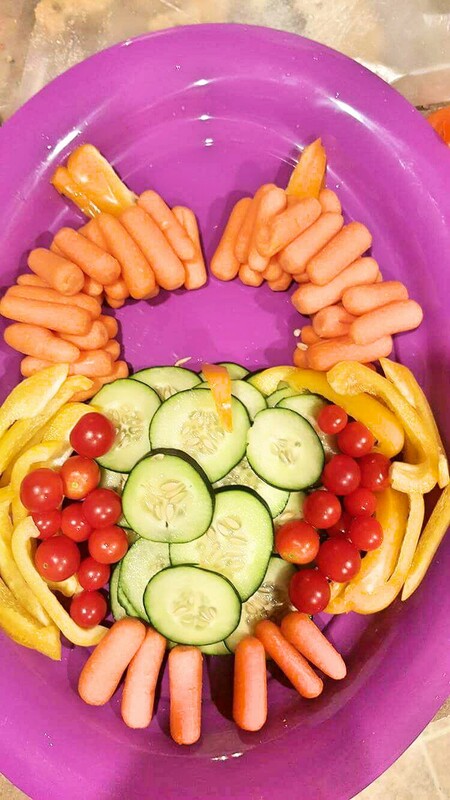 For food, we did potato salad, chips, sandwhiches for the kids, pinwheels for adults, deviled eggs, a vegetable and fruit tray in the shape of an owl. One of my other sisters did the fruit tray and I did the veggies. I left the eye area open to put ranch when we arrived at the shower. Then you top it off with a couple of cherry tomatoes as well for the eyes. So this is our bird themed baby shower. I didn’t take a picture of a couple of things, but she loved it all. If she didn’t, I’d have to beat her. Ha. That is absolutely adorable! 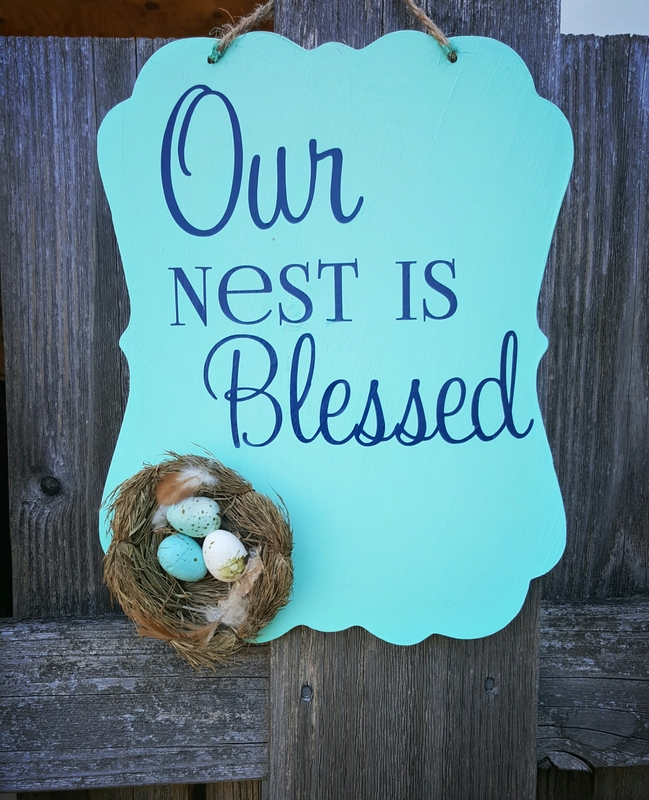 Birds are a classic choice for a baby theme, and I love the way you did it. Totes adorbs! I love the snack plate laid out like birds. That is too cute! Great job! 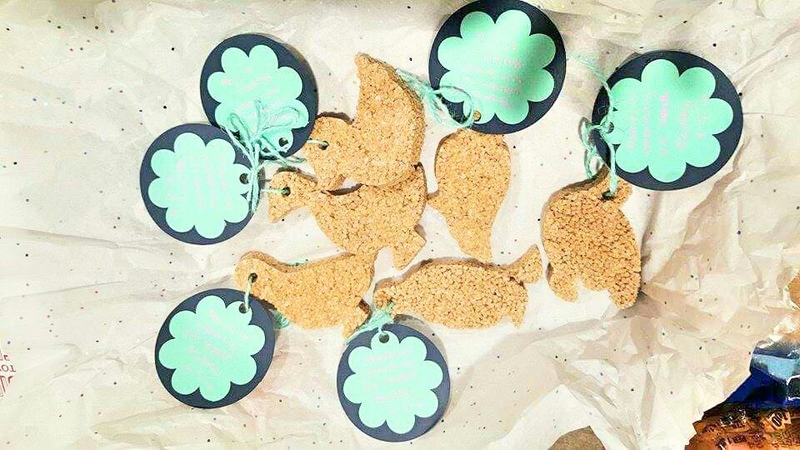 I absolutely LOVE the bird theme for a baby shower. 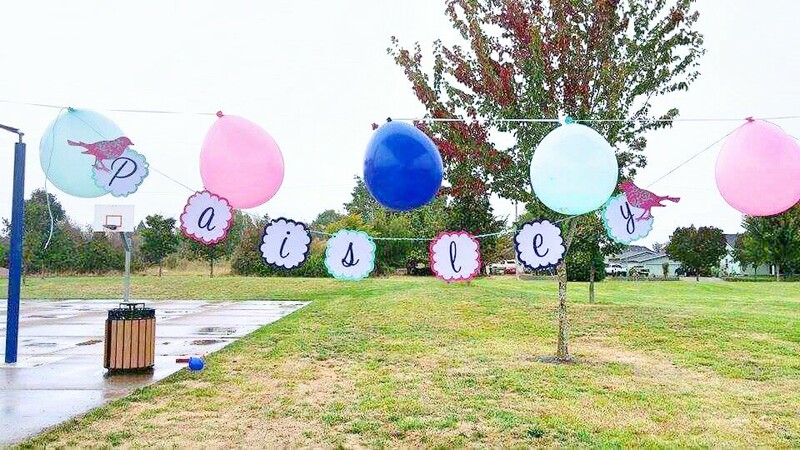 You did such a great job with all of the decorations and I’m sure your sister absolutely loved her party. I think this theme is so cute. It’s so unique compared to others. I really like it. Very cute theme. I’ve never seen such a theme for a baby shower. I’ve always seen little duckies, and rabbits, and all sorts of cutesy stuff, but nothing like this. Nice! Very crafty and creative. The snack platter is such a great idea. I never would have thought of this idea for a baby shower theme!!! This turned out great, I love the diaper cake! Such a cute theme for a baby shower. Love the fruit and veggie trays. Brilliant and yummy! This is a fantastic theme idea for a baby shower. I will have to share this with my friend. She is trying to plan a shower. This is adorable. I had a guitar/blue theme with my son. It ended up fitting my son very well. He is his daddy’s mini me and loves music. That is a gorgeous theme for a baby shower! My best friend will be having a party soon. I’m gonna have to share this with her. These treats are fantastic! Almost too cute to eat, but too cute not to eat! Congrats on the new baby in the family Auntie! Oh that is so very cute. Very country cottage and sweet. just adorable. 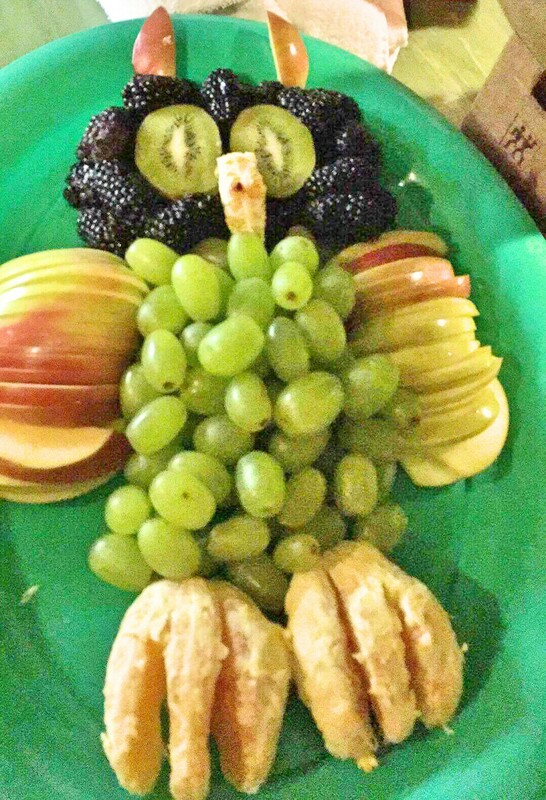 i especially love the owl shaped fruit plate. very creative!